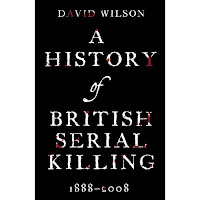 I've just been listening to the radio where David Wilson, a prison governor who'd worked with serial killers, was on plugging his book, A History of British Serial Killing . Very interesting he was too, particularly when eviscerating Jack Straw (who, for clarity, I should point out is probably not dealt with in the serial killer book). He had a quite different approach to those normally write books on this subject. His first point was that serial killers are boring, self obsessed and banal so when he set out to write a book about them his focus was on those they'd killed, giving them a voice. I think that's great. Whilst Silence of the Lambs was a great film the idea that serial killers are some sort of semi-mystical geniuses superior to the rest of us clearly isn't true and may actually not be a very useful approach if we want to stop people killing each other. His second point was that when you look at the victims of the serial killers, in the UK at least, they fall into five distinct categories. Children, old people, prostitutes, runaways and gay men. Which means, he claims, that if we're really interested in serial killers and want to protect society the best thing we can do is actually combat homophobia and protect vulnerable, ostracised groups. He states that "No Dutch serial killer has ever targeted prostitutes in Holland" because "every serial killer needs access to a suitable victim" who is not economically productive or does not have the protection of the state. "The victims of serial killers are those who live on the margins of our society, who are voiceless, who are powerless." The fact that serial killers are able to kill numerous times is because they pick on groups that are less integrated into mainstream society. The fact they choose the most vulnerable does not speak to how we deal with the killers but how we need to address the way we marginalise certain groups. I was extremely impressed with this approach.